These days acoustic guitars are constructed using all kinds of materials: carbon fiber, Ekoa, fiberglass, and even recycled metal. But the most common building material by far is still good old fashioned wood. The top, back, and sides of professional grade guitars are made of meticulously gauged cuts of solid wood, while beginner and intermediate models are built partly – sometimes entirely – with pressed plywood. Pressed plywood - referred to as laminate - is essentially multiple layers of thinly processed wood that has been pressed and bonded together with an adhesive for strength and stability. A major difference between laminate and solid wood guitars involves how the tonewood is sourced and processed. Where lower-end builds tend to require less refined (and, at times, questionably sourced) wood variations, today’s boutique flat top guitar builders rely exclusively on the most resonant cuts of solid wood. Sourcing these high-end materials requires not only planning and connections, but an ability to judge and assess the quality and potential resonance of raw, stockpiled wood. It is a skill that can quite literally take a lifetime to refine. Common knowledge would suggest that beginner players would choose a laminate guitar while professionals would opt for a high-end, entirely solid wood instrument. But, as you’ll see, there are more factors at play here than simply price point. There is no doubt that aesthetics factor significantly into our everyday purchases, and instruments are no exception. Boutique builders will often utilize more exotic wood species, such as Brazilian rosewood, cocobolo, or koa, but the limited supply of these materials means that these options – though visually striking – are simply not available at the more modest price points. Laminate guitars, on the other hand, can be made to accentuate certain color variations and grain patterns in the wood that are not only pleasing to the eye, but are far more cost effective as well. Many times these guitars are stained in such a way that an otherwise plain cut of maple or cherry wood, for example, can be made to look just as compelling as the solid wood options at a fraction of the cost. For the acoustic elitists, here is a category that should not be overlooked. Yes, your $5,000 solid wood, hand-built, exotic looking cannon of an instrument sounds phenomenal. I can practically hear a chorus of angels in the overtones, and that striking Adirondack spruce top is packed so tight with grains that I can barely count them with my naked eye. But let’s say you live in Seattle, travel regularly to Tucson for business, and your guitar is like a faithful companion that never leaves your side. Then what? Solid cuts of wood rely on their natural resins and the guitar’s bracing for stability. Rapid fluctuations in temperature and humidity can have some not-so-subtle effects on these instruments, and such changes heighten the risk of the wood developing cracks or glue joints becoming compromised. Due to the nature of their construction and their more complex patterns of overlapping grains, laminate guitars are far less susceptible to cracking. For this reason, they tend to be better suited for players who travel or for those individuals who simply require a more sturdy guitar. For many musicians, tone is everything. We willingly dish out unbelievable amounts of money for this slippery, mystical quality within an instrument. But is it justifiable? Sometimes, yes. And while there is doubtless a scenario that a $200 beginner laminate acoustic guitar could “out tone” a boutique, handcrafted solid wood instrument, the fact remains that tone is entirely subjective. The more I play and become attuned to the qualities of different tonewoods and building styles, the more I begin to appreciate the quirkiness and inconsistency of the budget-grade guitars built with less detail and exoticism. And these are instruments usually built with plywood. Go figure. But ultimately, a laminate guitar simply cannot resonate as freely as an all solid wood instrument. And where tone may not be quantifiable, the general consensus is that resonance and overall build quality of a guitar leads to harmony and balance in the overtones and that airy, piano-like quality that is undeniably pleasing to listen to. This is the big one. Price is without a doubt the main determining factor when deciding which guitar to buy, but it has also become the most complex. "There was a time when a cheap guitar sounded like a cheap guitar...However, those days are in the past." There was a time when a cheap guitar sounded like a cheap guitar. When it was played next to an instrument that was two, three, or four times its price, it would be clearly and immediately recognized as inferior. However, those days are in the past. Within the last 30 years or so, modernized building techniques and new, more sustainable methods of harvesting wood have brought about an increase in the number of high quality (though ultimately inexpensive) acoustic guitars. This has certainly skewed the playing field with regard to what we can get for our money. Today, solid top guitars are essentially an industry standard, even for budget-grade acoustics. A guitar’s topwood – being the most important factor with regards to the guitar’s overall tone and projection – profits immensely from the more resonant qualities of solid wood. And the fact that players at all stages can reap the benefits of a more resonant instrument is certainly something we can all relish in. There are currently a multitude of options below $1,000 that feature at least some amount of solid wood construction, and the value of guitar that you can acquire at this price point has never been better. So let’s have a look at some of our favorites. Revisiting the styles of department store plywood guitars from the 1930s and ‘40s has become an increasingly popular trend in the guitar world. The Gretsch Jim Dandy line is a totally vibey recreation of these quirky instruments. Priced under $200, these little axes are suited well to both kids and beginning - or couch-playing - adults alike. I’ll admit that I’m extremely hesitant about the sound quality of new instruments that sell for under $100. But once setup properly, you would be hard pressed to find a beginner dreadnought that sounds as good and plays as well as the S-35 at this price point. This OM sounds fantastic. Featuring a laminate cherry back and sides and a sophisticated burst finish over a solid spruce top, it sits at a very feasible price point for a Canadian built instrument. This is perhaps the best bang-for-your-buck guitar. I was pleasantly surprised at the sound put out by this 15/16th scale dreadnought—so surprised, in fact, that I bought one as a road trip/backup gigging guitar. Eastman Guitars have done much to begin reversing the stigmas around Chinese-made instruments. Utilizing their knowledge of mandolin and archtop guitar building, they have quietly become one of the best options in the solid wood, flat top guitar category. 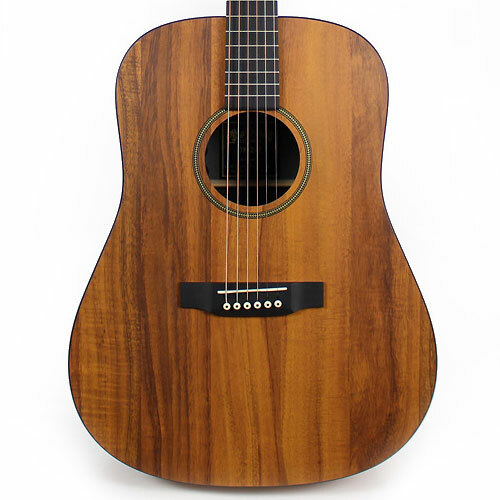 Recording King as a manufacturer has really stepped up their game in the past several years, with a marked improvement in build quality and the addition of torrefied tops to their range. 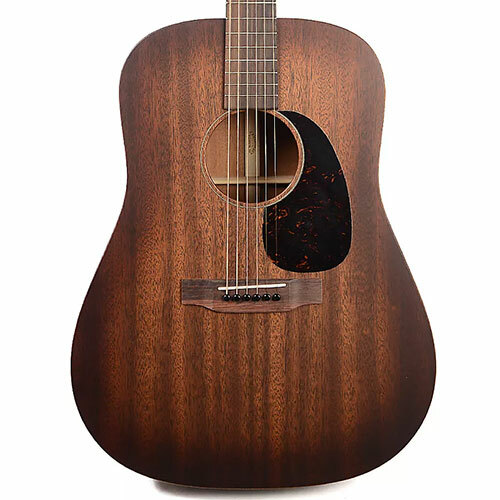 This dreadnought model has immediate response with a dry and crisp feel to it, similar to a vintage guitar. I would happily put this up against any other $500 acoustic guitar of any kind – even lower end Martins and Taylors.